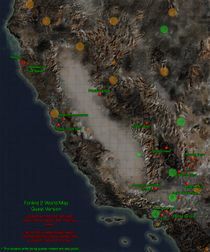 FOnline2 World map with quest locations marked on it. As any other MMORPG, the world of FOnline2 is full of various NPCs, and all of those NPCs have their own problems and plenty of caps they are ready to part with if you are willing to help them, while a wastelander (that would be you) needs caps and experience. See the connection here? Also, besides caps and experience, you can also receive many valuable items and positive karma as well. To explain it in a nutshell, doing quests is fun! Some of the quests require you to go to a specific quest-related location. It is however important to remember that once these locations become visible on your worldmap, you will have limited time to go to those locations and finish the taken quest (usually few days in real time, so make sure that you have informed yourself in advance about certain missions, since your character might not be tough enough to finish them, consequently making those locations disappear and the quests unfinished). Quests locations are private, meaning that only you can see them on the worldmap. However, you can lead other people with you so they can assist you in fighting your enemies, but they cannot see those locations without your guidance. Means that it's a one-time quest. Means that this quest can be done repeatedly, but only after a 5 hours cooldown. Means it's more of a little task than a quest. Means that the NPC who gave you the quest is a collector of certain items. "Kill them while they're small!" Do a Delivery for a Gecko Express. 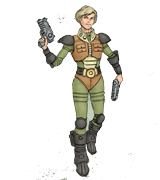 Bring holodisk to level 2 for Rombie. Bring Heartpills to Doc Zacharius. Bring Super Tool Kit to Pete . Bring Microcircuits for Mary Ann. Bring Radscorpion Tails to Doc Zacharius. Bring water for Joe Stinker. Bring 10 brahmin hides to the Tannery in Modoc. Robin Wood - The Bad, The Ugly And The Good. Get a beer for Adam. Get Heart Pills for Christopher. "I Won't Give You Squat!" Pass dinner for Charles from Iguana Bob. Deliver 10 fruits to Iguana Bob. Lavenders Flowers for Miss Binderson. This quests are currently blocked. Maybe one day they get unlocked? This page was last modified on 19 September 2016, at 17:19.